Speeding Light: Is red the colour for brands? I believe that red is the colour for brands, it expresses leadership, pioneering spirit, courage, energy, determination and spontanity. Many global brands have red logos either in whole or a sprint of it. Let me list some brands like Airtel, Vodafone, Wills, Pizza Hut, Dominos, Mc Donalds, Virgin Mobiles, Virgin Airlines, Air India, Malaysia Airlines, Mauritius Tourism Logo, Kingfisher, Coke, Pepsi, etc. I am sure I missed many. 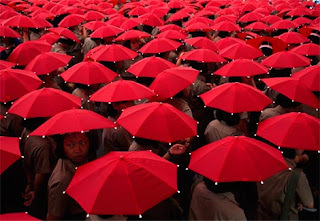 Techtonic examples of visual appeal from a local perspective are GIANI, Nirulas, almost all the Radio Channels, most of the TV channels, even a water vendor has red umberella as a shed! My recent visit to Indian Express' office captured my gaze on a wall which wrote the organisation's name on a red background. I do not rule out yellow, blue, black as active contenders. But largely the can augment their appeal with red! Contrary to my hypothesis, we have many success stories without red like Jet Airlines, Idea, and ??? any other? Please let me know. I believe that red helps in exploiting the identity of a brand. It helps in fearless and flamboyant display of existance. It has psychological & aesthetic affect while maintaining its eyecatching visual ability, that furthers association with the brand. Red is a colour that sends an alarm! It is the colour of blood. In a desert this is the colour that catches the eye from the greatest distance; hence the colour of the turban in Rajasthan. All STOP lights are Red! All danger signs are read! The most beautiful roses are red! This is the colour that attracts most - see the lipsticks! The dawn comes to the mountains in various hues of red! So, it will remain for all times to come the most outstanding colour for mankind.